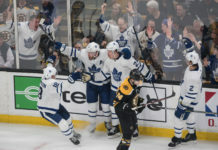 The Toronto Maple Leafs dropped their first road game of the season in Boston, while the latest report on the William Nylander saga stole the headlines on Saturday night. 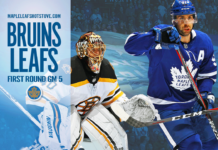 Let’s switch it up from the 10-points format and get into some unordered Sunday thoughts on the game as well as the Nylander situation. There was some good discussion yesterday stemming from Ian Tulloch’s piece at The Athletic on the role of the stretch pass and how the Leafs use it. It was interesting to then hear Willie Desjardins on After Hours last night talk about how he’s going to be pushing the Kings, who can’t score worth a lick right now and have endured major offensive dry spells at various times over the past couple of seasons, to stretch the neutral zone more. Ian’s point about how the Leafs are smart to use it to create space but need to find the right balance with shorter breakouts up the ice more often, in my opinion, is the correct one, and one we’ve been trying to get across in these reviews a lot the past few years. Given that we’ve clipped and criticized a lot of flips and stretch passes for icings in these reviews over the past few seasons, in the interest of mixing it up, here is one going for an icing — and it actually being the right play; i.e. the smarter, lower-risk option. The bump pass to the middle is high risk with the pressure coming from above and the forechecker closing on Dermott fast with the ability to potentially get a stick in that lane, while the option up the wall (Tyler Ennis) is covered off. Dermott ends up creating a potential one-on-one situation in space in the neutral zone with a diagonal flip to the far side. Josh Leivo is just a little out of it on the play and doesn’t identify what is developing until it’s too late, so the puck goes through him for an icing. When Mike Babcock points out that “the space is in behind,” this is what he is referring to. Executing a few of these successfully not only can create favourable situations for offense on the fast break, it serves to take the sting out of a forecheck if the other team has to back off and account for it. When the other team adjusts, though, the Leafs have to as well by using the underneath options. You just put that effort into practice and make practice your game. When I started out in Guelph as a junior player, I was a third goalie for the first half of the year. It’s where I really learned how valuable your habits and practice and on-ice warmup is. Every time you step on the ice, you have an ability to make an impact on whoever is watching you and you have an ability to make saves. There is no such thing as an unimportant shot. It is just going to be a commitment to make every save that I can every time I am given that opportunity here. It’s a new challenge, sitting a long time between starts. It is almost like you forget that feeling of being in the net. You try to say that practice is your game but you just can’t recreate gameplay. If I get another opportunity, I am going to look to do a little bit more with it. We’ve all been there — confident during the job interview, then reality hits. This was pretty foreseeable. It’s going to be difficult for Sparks to get the reps he needs to feel good about his game at this level playing in behind Andersen with Babcock’s approach to the workload split. He’s going to have to figure this out while playing spot duty if he’s going to stick as the backup here. This is not a development position; the job description is to take your starts in tough situations (oftentimes behind tired teams on the road) and give your team a chance to win. The difference between this role and the starting job is almost a different position altogether as far as the mental preparation required. Sparks should get another chance later this week, and the rope could get quite short without a better performance than we’ve seen collectively in his three games so far. It’s not that Sparks lost them the game on his own, given three of the goals were cross-ice passes to open forwards at the backpost, but he’s not inspired confidence in the crease from preseason onward. He didn’t give himself a chance with how deep, down, and out he was on the 2-0 goal, and the 5-1 goal went right through him. More than anything he did wrong on individual goals in this game, though, is that there are clear signs he is not a confident goaltender at the moment — note the toes are well short of the crease line below. Knowing the situation — back-to-back on the road, tired vs. rested team, strong opponent — this game versus Boston was marked for a likely L beforehand. Any point would’ve been a bonus, particularly with the Bruins angry coming off an 8-5 loss to Vancouver. But it felt like a missed opportunity that the Leafs didn’t give themselves an early lead — and it could’ve been a multi-goal lead — to build on nonetheless. The Leafs dominated the first period in what was one of their best starts to a game this season; they were winning all the battles and puck races and had all four lines going from puck drop. The game would’ve been a lot different with a bit more finish and luck around the net — the Leafs racked up a 15-2 shots advantage in the first nine minutes. One of the advantages — sometimes — to being in a back-to-back against a rested team is the opportunity to jump on the opponent early coming in having played the night before (the difficulty usually comes in later in the game when the tired legs start to catch up). The Leafs definitely did that, with an effective forecheck and really good puck pursuit in all three zones. Their early power play, set up by another good fourth-line shift, was excellent — with lots of urgency and purpose to their puck movement, and a bunch of opportunities in tight — but Jaroslav Halak was a wall in net. Getting the first goal is important on the road in a back-to-back; the Leafs didn’t get it before the game slipped away on them and the best line in hockey did its thing, while a few of the Leafs’ best players this year (including Morgan Rielly) had off nights. After flying out of the gates, the Leafs faded with the long change in the second period, which probably wasn’t unexpected in the situation. More Tavares – Marner magic on the power play made it briefly interesting heading into the third, and it was encouraging how the Leafs found a second wind in the third while manufacturing a bit of a push in the first half of the period, but the penalty and Bruins power play goal snuffed out any designs on a comeback. All in all, the final 5-1 scoreline was a little deceiving. I thought it was a respectable Leafs performance in a tough situation. – Interesting to see Travis Dermott get a short PP shift late in the man advantage on the Tavares goal. More to do with setting up for the end of the power play, but it’s something we’ve yet to see. Dermott doesn’t have much power behind his shot yet, but he can get them through, walk the line, and distribute the puck well. There may be a consistent secondary role there for him down the line, especially if a certain pending UFA isn’t back next year. – Mitch Marner stat pack for you: He’s making hay on the power play, but he’s also second in the NHL in primary points per 60, behind only Elias Petersson, at 5-on-5. Since he moved up the lineup off the JVR-Bozak line last season, he’s racked up 54 points in 47 games. That’s tied with Pastrnak and Marchand for 10th in the NHL over that time. Doesn’t include the nine points in seven playoff games, either. 19 points in 17 games is tied for John Tavares’ career best start from last year, also. The duo is working out as well as could’ve been expected. – Not sure what to make of the intermission report on William Nylander. If you’re at November 11th without a contract and you haven’t started to gather a good sense of the trade market for the player, Kyle Dubas wouldn’t be doing his job properly. I still don’t expect this ends in a trade, though — not this year, anyway. All indications are that Nylander would be happy in Toronto on the right deal, and that Dubas highly values him and knows a trade in the team’s current position is very likely a losing one. There are mixed reports as to whether the Leafs already did offer or if haven’t yet offered the David Pastrnak contract (6×6.67). Kypreos said they hadn’t last night, while Chris Johnston said today that the scuttlebutt was that they had, only for it to be later shot down. The Leafs really should be willing to offer that deal by now if we compare their overall entry-level production and adjust for cap inflation. Otherwise, it’s a reflection of a pretty unreasonable hardline stance from the organization. Nylander locked in at $6.67 million is the furthest thing from a cap-killing contract. Will it pay off with Nylander locked in at a good number long-term (that feels quite unlikely now), or will the Leafs end up with Nylander on a bridge anyway, with the relationship between the two camps potentially strained going forward (not to mention a bit of a poisoned perception of the player in the market)? I don’t expect Nylander will be traded this season, but it is getting harder to take Dubas at his word that Nylander will be a Leaf so long as he is GM.